Rochester, NY- Semrock announces expanded wavelengths for the EdgeBasic™ family of long pass-edge filters with the addition of 10 popular laser wavelengths to the 19 currently offered. Our EdgeBasic filters provide a superb combination of exceptionally steep edge locations (from 325 - 1319 nm) with extended blocking at and below the laser line, which is combined with consistent and extended high transmission pass bands. 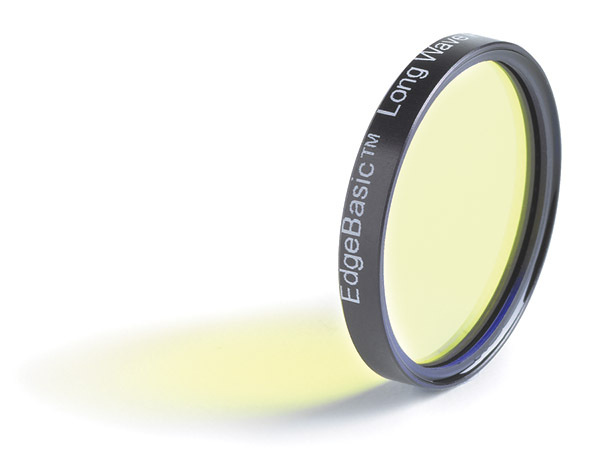 EdgeBasic filters were designed from the glass up to provide high performance at a great value and are ideal for fluorescence imaging and metrology applications. Used in application-specific Raman spectroscopy, they are a superb fit when exceptional laser-line blocking is required and the Raman shift measurement is not too small. Like all Semrock products, EdgeBasic filters have a proven hard coated, no burn-out durability that is backed by a five-year warranty. Visit Semrock.com and shop the newly expanded EdgeBasic filter family. Order your new Semrock filter before noon (EST) and it will be shipped the same-day, and guaranteed to meet your needs with our 30-day no-hassle return policy. Most of our catalog filters can be custom-sized and shipped in two days.